Very soft and neutral. Prefect for a guest bed. 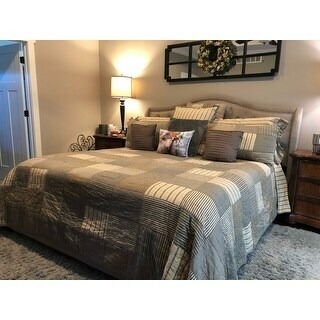 The Miller Farm Charcoal Luxury King Quilt's simple block pattern in various plaid and stripes work perfectly to set a Farmhouse mood for the bedroom. This cozy quilt is ash grey, creme, and black 100% cotton and echo hand quilted for years of enjoyment. Reverses to dark creme and charcoal grain sack stripes. This beautiful quilt goes great with the rustic country charm of our home! It fits true to size! Love that this quilt can be used both summer and winter! I would definitely buy this brand again! We received our Sawyer mill quilt today. It came packaged in plastic. It was so soft. We absolutely love the vintage look and feel of this quilt. Super satisfied. This is a nice, lightweight quilt. 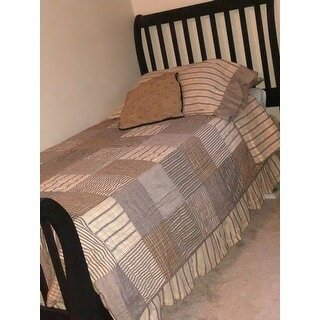 I purchased this quilt as a daybed cover and I am pleased with the price, the material (cotton), and the quality of this quilt. I sew and quilt in my spare time. I would be hard pressed to try and make this quilt for this price. This is exactly what I was looking for to go with my newly painted gray guest room. I wanted a cotton quilt in a somewhat traditional design and this works perfectly. The only negative I can see is the hand quilting. It is more of a large basting stitch but it doesn’t bother me. This quilt "deluxe" size was exactly what I wanted for my split king bed. I has a nice drop on each side and a good feel to the weight and texture. It feels like something my grandmother would have made. The colors aren't as bright as they look in the picture. I expected to see a sort of copper color....HOWEVER.... the colors are beautifully muted and very neutral. I love the stripes on the other side when I turn down the bed. I would buy this quilt again and this brand. Neither disappoint!! I love this quilt! It is always my choice personally to choose natural fibers, such as cotton, over microfiber, as in this one. It feels so wonderful. The look is important, as well as the quality construction, however, the "hand of the fabric is always important to me. This is perfect for a guest bedroom, in my opinion. I have bought many MANY quilts in my life, and this is by far- my favorite. It could have easily been quilted by a grandmother, and passed down through the years. The quilt is well pieced and even has the look of being hand-stitched. I ordered the king sized for our king size bed. The size is perfect, as it drapes almost to the floor on both sides. The care instructions are to only wash in large front loader washer. I own a large capacity top loading washer. I took a chance and washed it in cold water- knit cycle. It worked just fine! I absolutely love this quilt. I searched for months to find something this size 115x130 in order to avoid needing a bed skirt which I find to be a real pain. This quilt is beautifully made and of good quality yet not too heavy. I have a king size bed with extra pillow top and it hangs all the way down to the floor. I highly recommend this product and would purchase from Over Stock in the future. The colors are exactly as pictured. 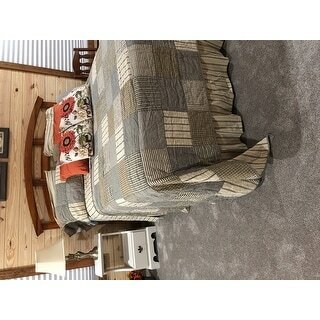 This quilt is very rich looking, well made and certainly exceeded my expectations. 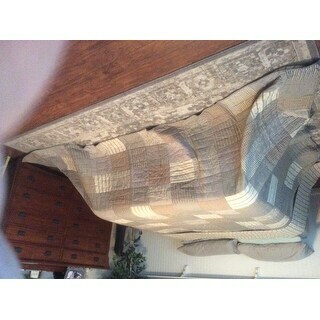 I chose to purchase the Luxury King at 120"x105" to fit our higher than normal bed. Good grief. It is HUGE! It fits our bed perfectly. Such a nice quality cotton quilt. Lightweight smooth and gorgeous in the bed. Don’t forget to buy the shams and pillow covers separately. The patchwork’s exquisite and firmly sown giving this quilt a rich expensive flare yet it is responsibly priced to fit a fixed income affordably. I recommend this quilt. If I could give this quilt a negative star rating I would. It’s cheaply made and for the amount they’re charging that’s absolutely unacceptable. For anyone who wishes to have a quilt that will last please don’t waste your time with this one. I’m finding the VHC brand is just horrible in everything they produce, which is just absurd considering they basically have the market cornered on quilt sets. I will steer clear of their products from now on. I wish I could return it. Love it, it is so beautiful on the bed and true to size. Light weight and great for my guess room. Wishing I would have put it in our room. 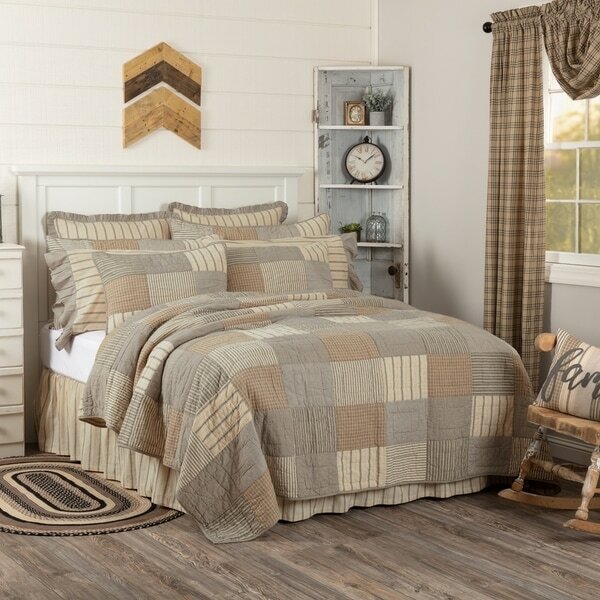 I love the looks of this comforter! It’s warm and cozy to me. I would have given it 5 stars, but wish it was a little thicker. I added a blanket to my bedding to make up for it. I love an oversized comforter, so I purchased the luxury size king. It’s perfect! Also - I will say that washing a thinner quit is a lot easier! I really love the comforter. I bought it because it’s practical yet still pretty. (I have animals, so it will get washed a lot!) I bought all the matching shams and pillow cases, and I think it makes it look so much cuter and put together. Love it! Very pretty and perfect addition to my farmhouse bedroom! I have not been much of a quilt guy but saw this and thought I'd try it. The farm house look is in and wanted something light for the summer. I was surprised how nicer it was in person. I tested it out for defects and to see the look, and I must say it looked pretty good. Nice warm colors, light, and seems to be made well. I got the shams also and they match perfectly. I recommend this for sure. I had been looking for that "perfect" rustic bedding set for quite some time and when I saw this on line, I knew this was it! It's even prettier in person! I wish the quilt was a little thicker, but it's so pretty, I don't even care...just thrown an extra blanket on. I also wish you could buy this as a set, but it's totally worth it to buy the shams, bedskirt, etc separately to make such a gorgeous set! Highly recommended! Really cute with my metal head board. "Do you have pillow shams and how much"
"Are the pillow shams for king size bed, larger than standard shams?" This is the quilt only. "What is the difference between a king and a luxury king?" A king quilt is 105 inches W x 95 inches L, a Luxury king is 120 inches W x 105 inches L.
"What is the size of the twin? 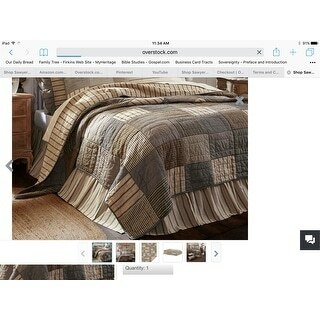 When I choose any size the dimensions of the quilt does not change in the product description." "All Queen set is $?" This is just the quilt. "in the one picture with the hanging wooden light above the colors seem rich in depth, but in the other bedroom they are lighter. Which is accurate as i am wanting the richer shade as pictured with the wooden light. thank you"
They are on the lighter side. It helped tone down my darker gray bedroom furniture. I love this set. "Does shams come with this queen set?" No, this is just the quilt. No. But the quilt is beautiful.